They are the gateway to the World Wide Web. Besides well-known browsers such as Mozilla Firefox, Google Chrome, Microsoft Edge and Apple Safari, there are also a number of other less well-known providers. Check out who has come out on top regarding secure surfing and how to find the best browser. Would you like to specify Chrome as your standard browser? According to research by WhoIsHostingThis.com, the majority of users of desktop PCs and mobile devices selected ‘Yes’ when asked in a pop-up.  More than half of internet surfers rely on the Google product, which the search engine giant promotes as the ‘quickest, free browser’. When surfing with desktop PCs, behind the market leader follows Internet Explorer with 19% and Mozilla Firefox with around 12% of users. This is different with mobile devices: here it is Safari, which takes second place as the standard browser of iPhones and iPads with around 30%, while only 7% of users surf with the Android browser. 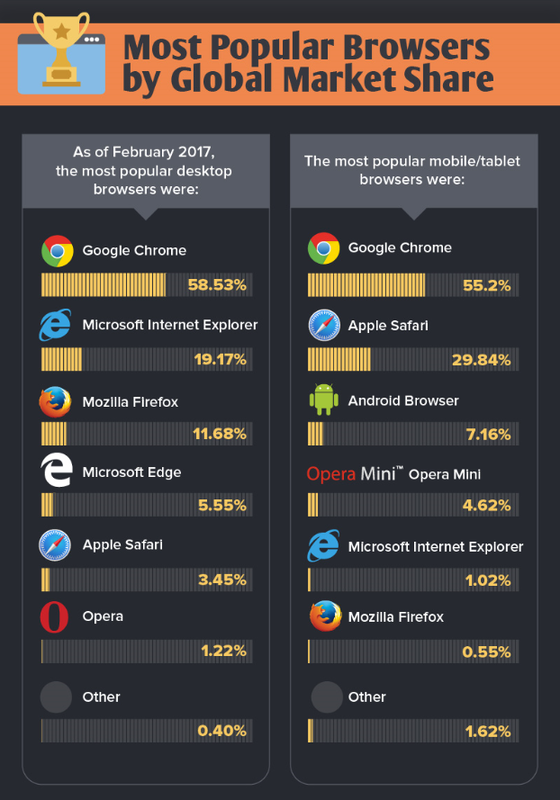 In terms of popularity that’s fine, but which is the most secure browser? More and more data is saved and shared on the internet, increasing the frequency of cyber crime and data breaches. Therefore web security should have top priority when selecting a browser. Even though Chrome is a favourite with users, it also leads the list of browsers, which are most commonly hit by cyber attacks. Therefore is users‘ trust in the internet giant not justified? WhoIsHostingThis found out that in 2016, Chrome was the most vulnerable browser with 176 security holes, while Safari had only 56. Opposed to these figures, however, is that over 50% of Chrome surfers and a whole 75% of Internet Explorer users use outdated versions of the browsers, which increases the target area for threats many times over. Around a third of Mozilla and Safari users are not using the latest versions. 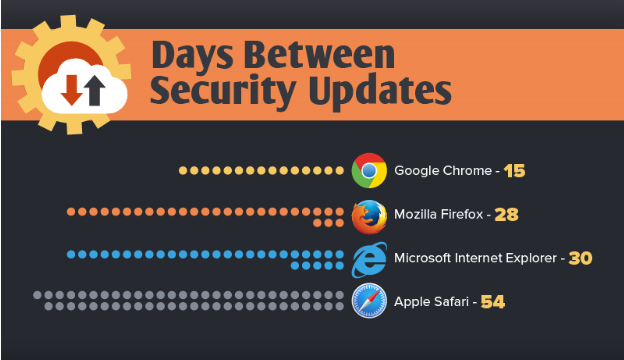 When taking a look at the frequency of security updates, then Google Chrome only seems to allow 15 days between updates and seems to be the fittest browser with regards to tackling problems. Users themselves can also contribute a lot to secure surfing. Automatic updates of browsers should be activated and ideally dubious content, such as spam emails, should not be opened. Besides anti-virus software, additional security add-ons can be installed, such as Adblock Plus, Disconnect, HTTPS Everywhere or 1Password. Users, who do not want to rely on a conventional browser, may possibly find a suitable alternative with browsers specifically designed around data protection, such as Commodore Dragon, Epic Browser or SRWare Iron. Netzsieger.de offers a comparison of various browser providers in the categories functions, usability and design, expandability, synchronisation, security and data protection, as well as system requirements and performance, which may be helpful when searching for a suitable browser. The browser is indispensable in every day work situations. For example, it is required to access digital workspaces, such as oneclick™. By using a trustworthy browser and following security information such as above, users not only surf risk-free, but also ensure highly secure mobile working via the internet.